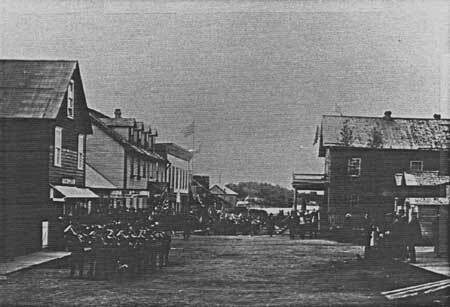 City, Town: Washington, D. C.
Parade on Lincoln Street, Sitka; Building 29 at left, courtesy Sheldon Jackson College. The only Russian American Company building remaining in Sitka today is located in the center of town, on Lincoln Street. Formerly "Governer's Walk" in New Archangel, capital of Russian-America, Lincoln Street is now the main street of Sitka, Alaska. Building No. 29, which served as a residence for Russian-American Company enployees, stands just a few doors from St. Michael Cathedral (NHL) and a short walk down Lincoln Street from the Russian Bishop's House (NHL). Historically, No. 29 was one of the many massive log buildings with steeply pitched roofs which served the commercial and administrative needs of the Russian American Company on this busy street leading up from the wharves. Today No. 29 is still at the commercial hub of the city, but through the attrition of time, culminating in a devastating fire in downtown Sitka in 1966, its bulk and roof line are a singular exception on Lincoln Street. Typically, Russian American company buildings were one to three stories and covered with steeply pitched gable or hipped roofs. Since company life was communal, buildings were large to accomodate multiple living quarters, corporate kitchen, bakery, laundry, and storage facilities. Massive round logs were used for warehouses and common residences. However, the more important company administrative buildings and officers' residences were hewn "so as to leave no crevices, with the internal and external logs so well dressed as to be suitable for painting or papering. "4 Building No. 29 was one of the latter carefully built and finely crafted structures. Sketches from 1868 and 1870 and recent investigations into the original portions of the building show that No. 29 was a two and one-half story log structure with a partial basement and horizontal gable roof and a two story side gallery covered by a shed roof. (ILLUS-3,4) The main unit (klet) was a nearly perfect square of logs measuring approximately 28 feet in length, or four sazhens (a Russian unit of measurement equal to seven feet). The flat hewn surfaces of these logs measure some 18 inches. The facade was divided into four bays of one sazhen each by the placement of three windows and an entrance door (to the gallery). The building rests on massive squared logs placed on a foundation wall of large stones. The sill log was originally several feet above grade; a raised stoop with approximately six steps and a railing provided access to the gallery entrance, from which the main building was entered. 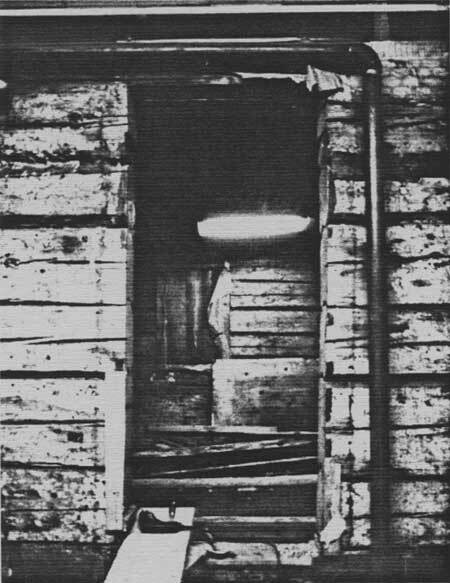 The interior as well as the exterior walls were constructed of hewn logs; ends from interior logs visible in the gallery measure 10" x 7" to 11" x 9". The logs were hewn flat on two sides, concave on the bottom and convex on the top, to fit snugly and shed moisture. Each log was marked with both a Roman and an Arabic numeral to indicate which wall and which course within the wall were its intended position. Full dove-tail notching joined logs at the corners. Floors were constructed of half-logs tenoned into sill and joist logs. Tongue-and-groove planks (1" x 6") were laid crosswise on the half-logs as decking. The gable roof employed a tinter-framing system with full-log corner braces notched into the plates. Insulation in the ceilings was typical of Russian buildings: a thick layer of sand supported by canvas which was stretched across the joists and nailed in place. A single brick chimney penetrated the roof line just east of the mid-point. The design and construction of the original doors is unknown; hand-forged iron hardware remains on one attic door. Likewise, the design and construction of the original windows cannot be established with certainty. Drawings (1870s) and photographs (1880s) show what are most likely the original, fifteen light double-hung windows (nine over six). Plain lintel heads appeared over the windows; molded cornices were added over the windows and entrance door some time in the 1880s. It is not known whether No. 29 was sided at the time of construction. 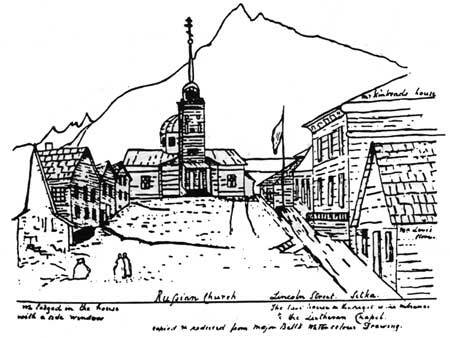 Early narratives describe the Russian buildings in Sitka as uniformly log in varying stages of weathering, or else painted with yellow ochre. Original plans for the Russian Bishop's House called for siding; however, this structure apparently received its siding in stages.8 Whether or not No. 29 was sided when it was built, in the earliest available sketch (1868) it appears to be sheathed in horizontal drop or shiplap siding. (This type of siding has been retained.) The roof originally may have been covered with tiles or standing-seamed metal; by 1870 it was shingled. All of the early views show a plank walkway running in front of No. 29 along the length of Lincoln Street. The building backs up to the bay; its rear yard contained several outbuildings and storage structures on pilings. Many changes have occurred on Lincoln Street in the almost 125 years since Russia sold its American colonies to the United States. With the exception of the Russian Bishop's House and Building No. 29, all Russian period structures have been destroyed. As Sitka has developed into a modern city, the installation of utilities, grading and paving of streets, and pouring of concrete sidewalks have altered the streetscape. The 1966 fire which destroyed St. Michael's Cathedral resulted in the loss of many nineteenth and early twentieth century buildings and the subsequent construction of new commercial and apartment buildings on Lincoln Street. The historic setting of No. 29 was also affected by in-filling of the tidal zone, which made possible the development of a major roadway and a full-sized building lot between No. 29 and the bay. Changes have taken place at Building No. 29, as well, both in its historic period and in recent years. These changes have been of four types: (1) additions to the original Russian klet which have not altered the original structure; (2) replacement of deteriorating materials with new, similar materials (roofing, siding, foundations); (3) "modernizing" by upgrading heating, plumbing, and electrical systems, redecorating interiors, and changing styles of window sash and exterior trim; and (4) alteration of window openings to accomodate commercial uses. Although the external appearance of the house has changed considerably since its construction, the original Russian structure is substantially intact. Original exterior walls, basement, floors, major portions of interior walls, most window and door openings, roofing system, attic with some of the original insulation, and the gallery side walls, floor, ceiling, staircase, and balustrade remain unaltered. 1. William H. Dall, Alaska and its Resources (Boston: Lee and Shepard, 1870), p. 255. 2. Delvan C. Bloodgood, "Eight Months at Sitka," Overland Monthly, February 1864, p. 179. 3. North Star, August 1896, p. 2. 4. U. S. Congress, House, Russian America, Ex. Doc. No. 177, 40th Cong., 2nd sess., 1868, p. 69. 5. Richard A. Pierce, "Alaska's Russian Governors: Rosenberg, Rudakov, Voevodskii...more Chief Managers of the Russian-American Company," Alaska Journal 2 (Summer, 1972):48. 6. G. H. Hamilton, The Art and Architecture of Russia, The Pelican History of Art (Baltimore: Penguin Books, 1954), p. 169. 8. 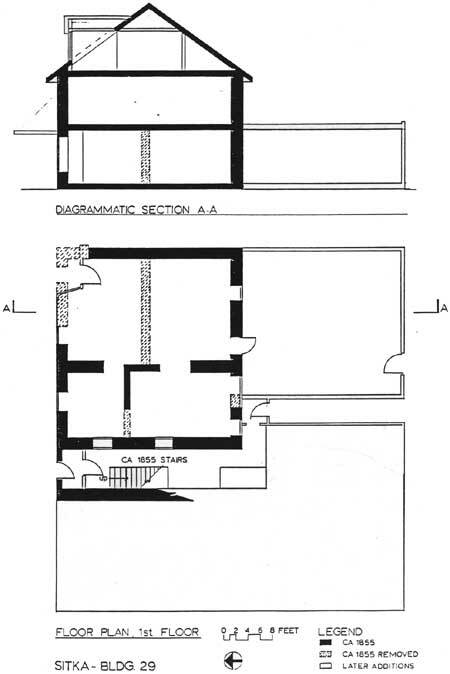 Paul C. Cloyd and Anthony S. Donald, Russian Bishop's House, Sitka National Historical Park, Alaska: Historic Structure Report (Denver: U. S. Department of the Interior, National Park Service, 1982), pp. 20-21. Interior of Building 29, by Robert Spude, 1985. Constructed under the Russian flag in the new world capital of New Archangel, Building No. 29 has exceptional significance as a rare example of a Russian-American colony structure. New Archangel, now Sitka, was the center of civil administration, trade, and manufacturing for Russia's American colonies. Building 29, so designated on the 1867 inventory of Russian-American Company property, is the sole, surviving Company building in Sitka today. In its origins and Russian period associations, it is an outstanding representation of Theme II, European Exploration and Settlement (Russian). Following the purchase of Alaska by the United States in 1867, Building No. 29 was associated with people and events significant to the first years of U.S. administration in Alaska. Building 29 is the only secular building remaining from Sitka's first years as seat of government for the new possession; it was owned and occupied by several individuals prominent in the establishment of civilian rule and the social and economic development of early Sitka. In its historic associations from this period, Building No. 29 has outstanding significance to the broad theme of U. S. Political and Military Affairs, 1865-1914 (Alaska History, Theme XXI). Although substantial changes to Building 29 preclude national significance under the theme of Architecture, it is worthy of recognition as a finely-crafted vernacular log structure from the Russian-American period with many original features intact. By the mid-1850s when the Russian American Company erected a new, two-story, hewn-log structure between St. Michael's Cathedral and the married employees barracks, the port of New Archangel was a half century old. It was not until 1799, when a struggle among the owners of the Shelikov Company and its competitors resulted in formation of the new Russian American Company, that Baranov was able to act on his intentions. In September of that year he sailed from Kodiak with 1,100 Russians and Aleuts to build a fort at Sitka. They chose a wide stretch of beach in a quiet bay for the new post. Tlingits on the island were hostile from the beginning; harrassment was constant. In 1802, after Baranov and many of the company employees had returned to Kodiak, the Tlingits attacked and destroyed the fort. Two years passed before Baranov returned to strike back. In spite of Russian guns, vessels, and superior numbers, it took the timely arrival of the gunboat Neva to turn the battle decisively in the Russians' favor. The Tlingits abandoned their massive stockade without surrender, but for the rest of their tenure the Russian American Company kept New Archangel heavily fortified, beleaguered by the continuing hostility of the natives. The site Baranov selected for a new fort was on a harbor cut deep into the island shoreline, a short distance from the scene of the recent battle. The harbor was large enough to hold an entire fleet and was free of ice year around; it was protected from winds out of any direction. Equally important, a broad outcropping of rock stood above the harbor on which formidable defenses could be erected. Construction began at once, and the Imperial double-eagle was raised to fly above New Archangel until it was lowered in 1867 for the American stars and stripes. In 1821, when the Russian American Company's charter was renewed for a second twenty years, Russia's colonial enterprises stretched from the Aleutian Islands along the southern coast of Alaska to Fort Ross (California) and southwest to the Sandwich Islands (Hawaii). The colonies were organized in five administrative units, each containing several ports, forts, redoubts, odinochkas (one-man trading posts), and artels (hunting parties).5 The central administration for all districts remained in New Archangel. Faced with increasing competition from British and American trade to the south, exploratory expeditions were sent out from New Archangel to conduct surveys in Bristol Bay and Norton Sound and along the major inland waterways. Several new posts were established during this period. Under Muryav'ev's administration (1820-25), the company policy to deny the Tlingits access to any of the islands in Sitka Sound was reversed. On the premise that it would be safer to keep an eye on the Kolosh than to leave them to their own devices, the toions (chiefs) were invited to settle beside the fort. New Archangel's fortifications were strengthened in anticipation of the move. From the three blockhouses along the stockade which separated New Archangel from the native village, cannon were trained on the company's new neighbors; an iron portcullis gate was constructed to admit natives during designated hours only, and never after dark.7 This move stimulated trade with the natives and ultimately developed a qualified, but interdependent, relationship between the Tlingits and the colonizers which persists in the physical and social structure of Sitka today. The Orthodox Church also established a strong presence in New Archangel during the second charter period. The missionary efforts of several decades, but primarily the gifted leadership of Father Ioann Veniaminov (later Bishop Innokentii), resulted in the baptism of several Tlingit toions. By the close of the second charter the Holy Synod endorsed Father Veniaminov's recommendations to reorganize the colonial Church, giving it more autonomy: a cathedral would be established in New Archangel with a seminary to train clergy for service throughout Russian America; the senior priest at New Archangel would supervise the church throughout the colonies.8 The seminary, built in 1840, and the new Cathedral of St. Michael Archangel, built in 1843-48 and reconstructed in 1966, are National Historic Landmarks, known respectively as the Russian Bishop's House and St. Michael Cathedral. Although the Russian American Company continued to show profits during its third charter (1841-1861), fifty years of intensive fur hunting by three maritime powers had resulted in depletion of fur seal and sea otter populations. The market for furs had also collapsed, silk hats replacing fur in western wardrobes. In response to the slowing fur trade, the company diversified and increased its activities on the Asiatic coast of the north Pacific. The 1850s found New Archangel, now usually called Sitka, the hub of new ventures, as well, including a flourishing ice trade with San Francisco and sales of fish and lumber in Hawaii and California. Whaling and coal mining were also pursued for a time. Sitka became an increasingly busy port, fifty ships calling in little more than a year.10 The company continued to construct new facilities in Sitka into the early 1860s. It was during this period of heightened activity that the building later identified as No. 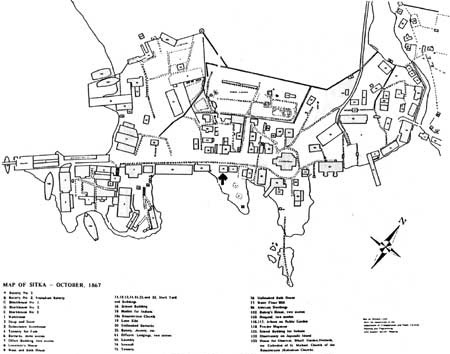 29 (1867 protocol map) was constructed. When the Russian American Company's charter expired in 1861, it was not renewed. Inspectors for the Naval and Finance Ministries concluded that the company's future was not bright; the fur trade remained weak, and the new ventures of the past decade had faltered. The Crimean War had depleted the Imperial treasury and focused Russia's attention on Europe; official policy actually precluded consolidation of American holdings. Further, the Russian American Company was becoming increasingly expensive to operate. To sell the colonies to the United States would have both political and financial advantages.11 Thus, in 1867, the territory and assets of the Russian American Company became possessions of the United States. With the purchase of the colonies, Building No. 29 appears in the historic record as a prominent Sitka property. It is one of the buildings specifically identified on the 1867 inventory map of the Russian-American settlement and was owned or used by individuals who played significant political and social roles during Alaska's early years as a U. S. possession. Recognizing the futility of trying to maintain law and order as a sole agent, let alone provide civil administration and balance competing interests, Dodge and several other individuals with high stakes in Sitka formed a provisional city government and Mayor's Court. Dodge was elected mayor and held that position for three years. Dodge must have lived in No. 29 for a time. 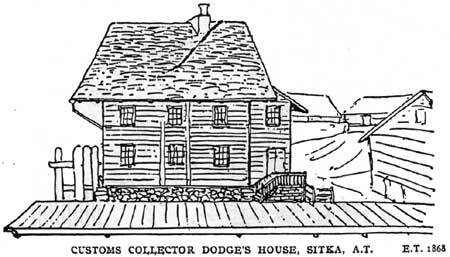 A visitor to Sitka in 1868 sketched the building and labeled it "Custom Collector Dodge's House. "15 (ILLUS #3) In the spring of 1870, however, John Kinkead was using the building as a residence and place of business. No. 29 may have served as Sitka's post office during Kinkead's tenure as postmaster.16 At the time Kinkead is associated with the building, Dodge was still the owner. However, by late 1869 he had begun to disentangle himself from what had turned out to be a disappointing Sitka venture. Kinkead was himself a significant personage in Sitka's history, first as a local politician and business man and eventually as governor of Alaska. Like Dodge, he arrived before the transfer with an official appointment as Sitka's postmaster. An additional appointment, as Post Sutler, gave him an inside track to the Army's liquor business.17 Upon arrival in Sitka, Kinkead entered a partnership to conduct a mercantile and fur trading business, as well. The Sitka Times noted in June, 1869, that "Louthan and Kinkead" were doing business on Lincoln Street. Their firm operated a 10-ton schooner, Sweepstakes, for trade along the southeast coast of Alaska. Later that year the partnership dissolved and Kinkead continued on "at the old location," which was almost certainly No. 29.18 Kinkead was also a partner with Dodge in the brewery. Following the passage of Alaska's Organic Act in 1884, Kinkead served a nine-month term as Alaska's first governor. Cozian, a native of Dalmatia (then in Austria), was a sea pilot enployed for several years by the Russian American Company. He was one of many company employees who remained in Sitka to seek their fortunes under a new flag. In time he became a naturalized citizen.20 During the spring after transfer, Cozian departed Sitka to pilot the schooner Langley on a four month trading voyage. In 1869 he was hired to pilot the steamer Newbern for General Tomkins' inspection tour from Sitka to Kodiak and Cook's Inlet.21 A reef in Peril Strait, Alexander Archipelago, was discovered by Cozian and named after him in 1880.22 It is likely that Cozian used No. 29, or a portion of it, as his residence. For sixteen years, from 1870 to 1886, the record is silent concerning No. 29 on Lincoln Street. The provisional government had failed; records kept by the Collector of Customs and the Navy Commander's reports constitute the official records until civil government was established in 1884. Information from 1886, however, yields some clues to the building's history in the previous decade. On February 9, 1886, Samuel Milletich, executor for the estate of Antonio G. Cozian, sold the real estate holdings of the deceased at public auction, Building 29 was not among the properties sold. Two weeks later, however, Milletich sold Building 29 to Phillip S. Wittenheiler of Sitka. Samuel Milletich was one of the early investors in Sitka who stayed through the hardest times and succeeded. A fellow Dalmatian, Milletich apparently was a trusted partner and compatriot of Cozian; they owned some property jointly, and Milletich ultimately served as Cozian's executor. Since No. 29 was not included in the estate, and newspaper references to Milletich's sale of the building suggests that he had owned it for some time,23 it is likely that Cozian had sold No. 29 to Milletich before civil records were established in 1884. 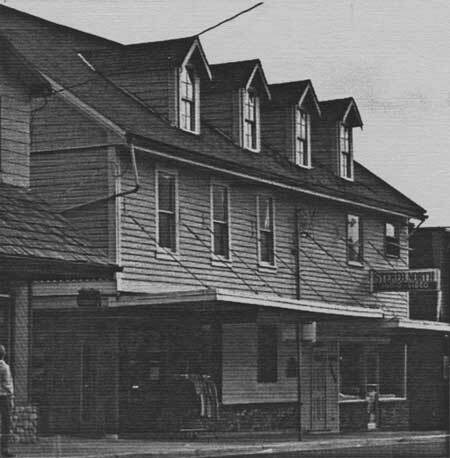 The new owner, Phillip S. Wittenheiler, did some renovation work on the building prior to leasing it to a Captain Cowles, who was involved in mining at Silver Bay.25 Cowles and his family were to live upstairs, while they sub-leased the ground floor rooms to the Millimore Hotel across the street.26 Meanwhile, Wittenheiler was preparing to move his family to Juneau as he took up duties as deputy U. S. Marshal there. Wittenheiler served for two years before returning to Sitka and taking up residence in No. 29, Lincoln Street. Once back in Sitka, Wittenheiler was engaged in a variety of activities. He leased the Millmore Hotel for a time, made some improvements to No. 29 (1891), and owned and operated a fur sealing schooner. He was also involved in Sitka's lumber industry.27 In October of 1892, Wittenheiler again left Sitka to become Inspector Afloat for the U. S. Customs Service on the steamer Al-ki. 28The Register of Deeds shows that Wittenheiler sold No. 29 to Peter Callsen in September of 1893 for $3,000.00. Callsen was a master carpenter; his skills are frequently remarked upon in the Sitka newspapers. Among many projects in Sitka, he built three houses on the Greek Church Mission property, Nos. 35, 104, and 105 (Russian Bishop's House NHL),29 and replaced the roof of St. Michael's Cathedral. In 1960 No. 29 passed out of the hands of the Tilson estate. It has gone through a series of owners, all of whom retained a pattern of use established decades before: living quarters on second floor (rented apartments from the 1940s to the present), and commercial retail uses on first floor of both the original log portion of the building and the 1880s frame annex. In recognition of their national historical significance, twelve sites associated with the Russian presence in America have been designated National Historic Landmarks. Ten of these are in Alaska, representing aspects of Russian exploration and settlement and the Russian heritage that continued to flourish after the raising of the American flag. Two additional sites, Fort Ross in California and the Russian Fort in Hawaii, represent the Russian American Company's expansion efforts intended primarily to assure supplies for the isolated Alaskan colonies. Six additional Russian period buildings were recognized in the National Survey of Historic Sites and Buildings carried out in Alaska in 1961. Two of these were in Kodiak, the Lowe House and Hubley House; four were in Sitka: the Buldakoff Dwelling Russian American Company Warehouse, Church Warden's House, and Russian Residence (Building No. 29). Catastrophic lossesthe 1964 earthquake and tsunami in Kodiak and the 1966 fire in Sitkaand demolition by owners have resulted in the destruction of all but one of these structures: the Russian residence, Building 29, in Sitka. Building No. 29 is comparable to the recognized Landmark sites in its historical significance and structural integrity. In fact, it represents historical associations and architectural features not found in other extant structures. Only three of the twelve National Historic Landmark sites have standing Russian-American period buildings: Fort Ross, Erskine House (Kodiak), and Russian Bishop's House (Sitka). St. Michael Cathedral NHL, Sitka, is a reconstruction of the 1848-50 church. Each of these sites, including No. 29, is a unique representation of the Russian colonial role in American history. Fort Ross NHL. Fort Ross is unlike any of the other Russian sites in that it was established essentially for agricultural purposes. The protective stockade enclosing a small cluster of buildings was surrounded by orchards and fields. Because it was designated a state historic site in 1906, before development along the Sonoma coast affected the integrity of setting or site, Fort Ross has been managed with the aim of preservation for 80 years. Nonetheless, a combination of earthquake damage, repeated fires, and reconstruction programs conducted without rigorous archeological and architectural documentation have resulted in a site with high interpretive value but little original fabric or workmanship.33 The Rotchev House, built in 1836 for the last Fort Ross commandant, is in some ways comparable to No. 29 in Sitka. The exterior log walls are original, as may be several of the interior partition walls. However, a fire in 1972 destroyed the roof and many interior finishes and furnishings, necessitating extensive repairs and some reconstruction.34 Building No. 29 exhibits complete structural systems, as well as original materials in exterior and interior walls, window and door frames, joists, rafters, floors, and roof members. The structure has been much altered, both on the exterior and interior. However, like No. 29, the heavy log walls still exist "in large part." Also like No. 29, the additions date from ca. 1880.36 Unlike No. 29, the original roof of the Erskine House has been replaced, possibly as a result of fire; the interior room partitions "are poorly constructed and obviously not original"; and the second floor stair rail and newel post "appear to be of a later period. "37 Although No. 29 almost certainly retains more original fabric than the Erskine House does, the point is somewhat academic. Both buildings have substantial integrity behind their exterior modifications, and each is a sole extant representative of a Russian colonial building type and of a significant chapter of the history of Russian America. The Russian Bishop's House was built for the Orthodox church as a seminary and clerical residence; it thus had a specialized form and function. Building No. 29 was built as a residence for the Russian American Company, and thus represents a secular housing typethe only example remaining in Alaska. One feature the two structures have in common is a side entrance gallery, typical of Russian vernacular buildings from Kiev to Siberia. The galleries of the Russian Bishop's House have been reconstructed from interpretations of original plans; the original galleries, themselves, had been rebuilt in a new configuration in 1887.39 At No. 29 the original gallery with its flooring, staircase, and balustrade remain intact except for the roof, which was modified to accommodate the 1880s addition. Now a part of Sitka National Historical Park, the Russian Bishop's House is in the final phases of restoration. Visually, it has greater integrity of setting, materials, and design than does No. 29, which presents an altered face to Lincoln Street. The integrity of No. 29 resides in the relative completeness and coherence of original form and fabric behind its compromised facade. No. 29 is a primary document in the vernacular architecture of the Russian colonies. Thus the two remaining Russian period structures in Sitka complement each other. A study of one can illuminate the other, while they each represent one of the driving forces in the Russian occupation of America: the Russian American Company and the Russian Orthodox Church. By 1961, when the National Survey of Historic Sites and Buildings study was conducted in Alaska, many of the Russian period structures had been lost to fire and demolition. However, enough remained that the North Star's description could still apply to Sitka. Twenty-five years later, only two, irreplaceable, structures remain: the Russian Bishop's House and Building No. 29. Today No. 29 on Lincoln Street is the only building in Sitka to tell the story of the Russian American Company and its enployees, who came to expand an empire through the wealth of furs. It is the only building which embodies Sitka's transition from the Russian capital, New Archangel, to Sitka, capital of Alaska. No. 29 is the only building which remains to tell of the Company men who stayed to seek their fortunes under the American flag and of the frontier adventurers, investors, aspiring politicians, civil servants, immigrants, tradesmen, and entrepreneurs who flocked to an old Russian capital to fulfill their American dreams. 1. P. A. Tikhmenev, A History of the Russian American Company, trans. and ed. by Richard A. Pierce and Alton S. Donnelly (Seattle and London: University of Washington Press, 1978), pp. 44-5, 62; Hector Chevigny, Russian America: The Great Alaskan Venture, 1741-1867 (Portland: Binford and Mort, 1965), pp. 95-6. 2. [K. T. Khlebnikov], Kyrill T. Khlebnikov's Reports, 1817-1832, trans. with Introduction and Notes by Basil Dmytryshyn and E. A. P. Crownhart-Vaughn (Portland: Oregon Historical Society, 1976), pp. 40-1, 90-1. 4. Khlebnikov, pp. 75, 91. 5. James R. Gibson, Imperial Russia in Frontier America: The Changing Geography of Supply of Russian America, 1884-1867 (New York: Oxford University Press, 1976), p. 11. 8. Richard A. Pierce, "Russian Governors: Etholen and Tebenkov, more Chief Managers of the Russian American Company," The Alaska Journal 2 (Spring 1972):19; Tikhmenev, p. 374. 11. Ted C. Hinckley, "Alaska Pioneer and West Coast Town Builder, William Sumner Dodge," Alaska History 1 (Fall 1984):6. 13. Juneau, Alaska, Office of the District Recorder. Sitka Deeds, Book C.
15. Teichmann, Oskar, ed., A Journey to Alaska in the Year 1 Being a Diary of the Late Emil Teichmann (New York: Argosy-Antiquarian Ltd., 1963), p. 190. 16. 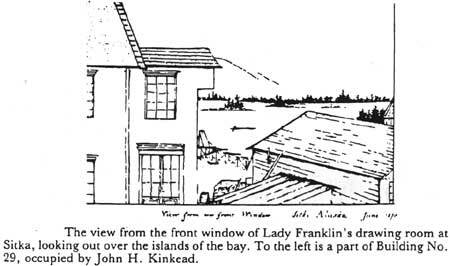 R. N. DeArmond, ed., Lady Franklin Visits Sitka, Alaska 1870: the Journal of Sophia Cracroft, Sir John Franklin's Niece (Anchorage: Alaska Historical Society, 1981), p. 80. 17. R. N. DeArmond, Sitka Notes, ms.
18. Alaska Times, 9 October 1869. 19. Sitka Deeds, Book C.
20. Naval Census, 1880 and 1881, in Reports of Captain L. A. Beardslee, Relation to Affairs in Alaska, Senate Exec. Doc. No. 71, 47th Cong., 1st sess. (Washington: GPO, 1882). 21. U. S. Customs records and Richard A. Pierce, "Alaska Shipping, 1867-1878," cited in DeArmond, Sitka Notes. 22. Marcus Baker, Geographic Dictionary of Alaska (Washington, D.C., 1906), cited in DeArmond, Sitka Notes. DeArmond, Sitka Notes. 23. The Alaskan, 6 March 1886. 24. The Alaskan, 6 March 1886. 26. The Alaskan, 6 March 1886. 27. De Armond, Sitka Notes; North Star, October 1889, p. 90; Sitka Deeds. 29. Report by Vladimir Donskoi, No. 23, February 4 and 16, 1887, Library of Congress, Alaska Russian Church Archives, cited in Paul Cloyd, Historic Structure Reports for House 105 and the Old School (Denver: National Park Service, 1984), p. 3. 30. Sitka Deeds, Vol. 3, pp. 213-15. 31. Interview with Lena Tilson Freeland, Sitka, 1 November 1985. 32. Freeland, 1 November 1985. 33. Bickford O'Brien, ed., Fort Ross: Indians, Russians, Americans (Jenner, Calif.: Fort Ross Interpretive Association, 1980), pp. 34-40. 34. Telephone interview with Bryn Thomas, Archeology and Historical Services, Eastern Washington University, 28 February 1986. 35. John A. Hussey, et al, Feasibility Report: Erskine House, Kodiak, Alaska (San Francisco: National Park Service, Department of the Interior, September 1965), p. 3. 36. Hussey, p. 10, 33. 37. Alfred C. Kuehl, [Field Report, 1963], quoted in Hussey, p. 10. 38. Interview with Gary Candelaria, Sitka National Historical Park, 18 June 1985. 39. Paul C. Cloyd and Anthony S. Donald, Historic Structure Report: Russian Bishop's House, Sitka National Historical Park, Alaska (Denver: National Park Service, Department of the Interior, 1982), pp. 43-44. 40. North Star, August 1896, p. 2. Building 29, by Kathleen Lidfors, 1985. Alaska History, 1741-1910; National Survey of Historic Sites and Buildings, Theme XXI: Political and Military Affairs, 1865-1910. A Special Study. Washington, D. C.: U. S. Department of the Interior, National Park Service, 1961. Alaska Times, 9 October 1869. Alaskan, The, 6 March 1886; 4 May 1889. Andrews, C. L. The Story of Sitka. Seattle: Lowman and Hanford Co., 1922. Bloodgood, Delvan C. February, 1864, "Eight Months at Sitka." Overland Monthly, pp. 175-86. Candelaria, Gary. Sitka National Historical Park. Interview, 18 June 1985. Chevigny, Hector. Russian America: The Great Alaskan Venture, 1741-1867. Portland: Binford and Mort, 1979. Cloyd, Paul. Historic Structure Reports for House 105 and the Old School. Denver: U. S. Department of the Interior, National Park Service, 1984. Cloyd, Paul C. and Anthony S. Donald. Russian Bishop's House, Sitka National Historical Park, Alaska: Historic Structure Report. Denver: U. S. Department of the Interior, National Park Service, 1982. 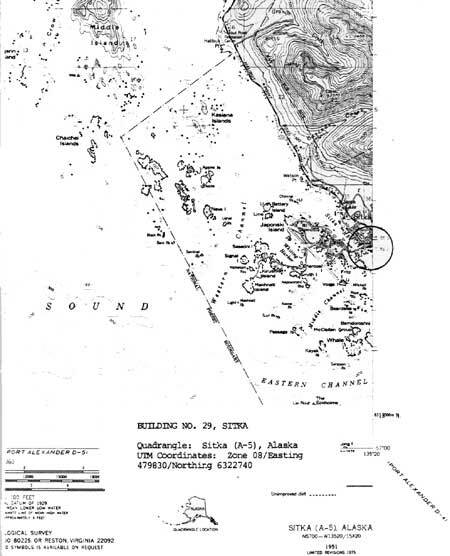 Dall, William H. Alaska and its Resources. Boston: Lee and Shepard, 1870. DeArmond, R. N., ed. Lady Franklin Visits Sitka, Alaska 1870: the Journal of Sophia Cracroft, Sir John Franklin's Niece. Anchorage: Alaska Historical Society, 1981. DeArmond, R. N. Sitka notes. Ms.
Freeland, Lena Tilson. Sitka, Alaska. Interview, 1 November 1985. Gibson, James R. Imperial Russia in Frontier America: The Changing Geography of Supply of Russian America, 1784-1867. New York: Oxford University Press, 1976. Hamilton, G. H. The Art and Architecture of Russia. The Pelican History of Art. Baltimore: Penguin Books, 1954. Hansen, Hans Jurgen, ed. Trans. Janet Seligman. Architecture in Wood: A History of Wood Building and its Techniques in Europe and North America. New York: Viking Press, 1971. Hinckley, Ted C. "Alaska Pioneer and West Coast Town Builder, William Sumner Dodge." Alaska History 1 (Fall 1984): 1-26. Hussey, John A., et al. Feasibility Report: Erskine House, Kodiak, Alaska. San Francisco: U. S. Department of the Interior, National Park Service, 1965. Juneau, Alaska. Office of the District Recorder. Sitka Deeds, Book C.
[Khlebnikov, K. T.] Kyrill T. Khlebnikov's Reports, 1817-1832., Trans. with introduction and notes by Basil Dmytryshyn and E. A. P. Crownhart-Vaughn. Portland: Oregon Historical Society, 1976. Mote, James D. The Russian Bishop's House, Sitka National Historical Park, Alaska; Historic Resource Study. Denver: Denver Service Center, National Park Service, 1981. North Star (Sitka), August, 1886; October, 1889. O'Brien, Bickford, ed. Fort Ross: Indians, Russians, Americans. Jenner, Calif.: Fort Ross Interpretive Association, 1980. Pierce, Richard. A. "Alaska's Russian Governors." Alaska Journal 1-3 (Spring 1971-Winter 1973): 49-52; 41-43; 38-45; 21-24; 19-27; 40-48; 21-24; 20-30. Sitka, Alaska. Recorder of Deeds. Old Sitka Records, Vols. 1-3. Teichmann, Oskar, ed. A Journey to Alaska in the Year 1868: Being a Diary of the late Emil Teichmann. New York: Argosy-Antiquarian, Ltd., 1963. Thomas, Bryn. Archeological and Historical Services, Eastern Washington University. Telephone interview, 28 February 1986. Tikhmenev, P. A. A History of the Russian-American Company. Trans. and edited by Richard A. Pierce and Alton S. Donnelly. Seattle and London: University of Washington Press, 1978. U. S. Congress, House. Russian America. Ex. Doc. No. 177, 40th Cong., 2nd sess., 1868. U. S. Congress, Senate. Affairs in Alaska: Reports of Commander L. A. Beardsley, Commanding U. S. Ship Jamestown, from June 15, 1879 to January 22, 1880. Ex. Doc. No. 105, 46th Cong., 2nd. sess. U. S. Congress, Senate. Reports of Captain L. A. Beardslee, U. S. Navy, Relation to Affairs in Alaska. Ex. Doc. No. 71, 47th Cong., 1st sess. BUILDING NO. 29, SITKA. Quadrangle, Sitka (A-5), Alaska. ILLUSTRATION 3. BUILDING NO. 29, SITKA, 1868. Reproduced in A Journey to Alaska in the Year 1868: being a diary of the late Emil Teichmann, reprinted 1963. ILLUSTRATION 4. BUILDING 29, SITKA, 1870. ("Mr. Kinkead's House"). Reproduced iin Lady Franklin Visits Sitka, Alaska, 1870, R. N. DeArmond, ed., 1981. ILLUSTRATION 5. BUILDING NO. 29, SITKA, 1870. Reproduced iin Lady Franklin Visits Sitka, Alaska, 1870, R. N. DeArmond, ed., 1981.